We're very pleased to announce that part of the proceeds from our Saturday Matinée performance of 'Allo 'Allo will be going to support the very worthwhile charity, the Bone Cancer Research Trust. Tickets are available on our website for the show - just click the "Buy Tickets" link! 'Allo 'Allo - Saturday Matinée Tickets Available! FURTHER SATURDAY TICKET AVAILABILITY is now on sale, as we've added in a Saturday afternoon matinée performance (1.30pm) due to popular demand! This hilarious comedy is once again being brought to life by Culter Theatre Club, after we first performed it in 2012. We've got some familiar faces in the cast, and some wonderful new performers to get you laughing - just watch you don't snort your red wine while eating your Brie when you see René's sausage! If you've been before you'll know what a great show this is, so let your friends know so they don't miss out - we expect tickets to go quickly as all the previous shows have been sell-out performances! For the first time this year, we're even doing online ticketing so you can book tickets through our website partner "Ticket Tailor", by debit or credit card. Performances are 7th, 8th and 9th September and start at 7.30pm, with the additional Saturday Matinée taking place at 1.30pm. It'll be café style table seating, and you can bring your own bottle and snacks (we'll provide nibbles too!) - then just sit back and enjoy the show! 'Allo 'Allo Tickets On Sale Now! TICKETS ARE NOW ON SALE for our Autumn show of 'Allo 'Allo. This hilarious comedy is once again being brought to life by Culter Theatre Club, after we first performed it in 2012. We've got some familiar faces in the cast, and some wonderful new performers to get you laughing - just watch you don't snort your red wine while eating your Brie when you see René's sausage! Performances are 7th, 8th and 9th September and start at 7.30pm. It'll be café style table seating, and you can bring your own bottle and snacks (we'll provide nibbles too!) - then just sit back and enjoy the show! 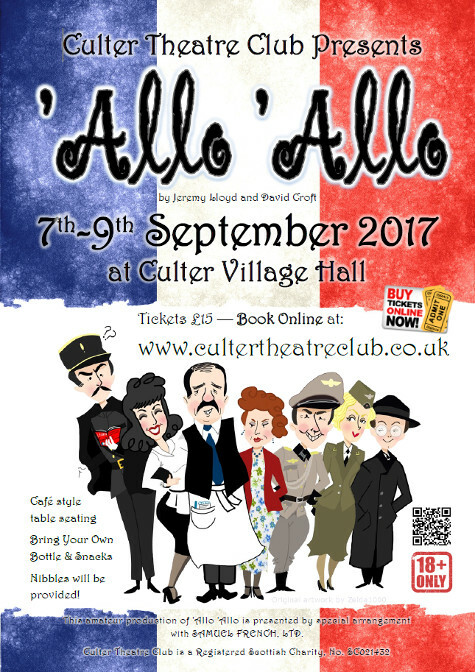 By popular demand, we are looking at doing another run of Allo Allo again this year, the first week of September. We will be holding OPEN AUDITIONS on the 3rd and 4th May at 7.30pm at Culter Village Hall. If anyone is interested in any of these roles, or knows anyone that would be, please come along to one of the audition evenings! Stage experience is not required - just enthusiasm! If you have always thought about being on stage now is your chance. Audition pieces to read will be available on the audition evenings. Kathleen Robertson, reporter at the Deeside Piper, wrote a great article about last week's production of 'Allo 'Allo today, saying that there were "no superlatives good enough to describe the stunning professional performance". And Culter Theatre Club had at least one other happy audience member as well, when World War Two veteran, Jim Blair travelled all the way up from Glasgow for his 90th birthday and chose to see our production of 'Allo 'Allo. Jim who has been much involved in amateur theatre in Glasgow voted the Culter production as "well worth the travel from the central belt". See the Deeside Piper Allo Allo Review article. Café René was open during a special time this year - and that is of course Comic Relief's, "Red Nose Day". As 'Allo 'Allo is all about having fun and lots of laughter, this year at the end of the show we asked our Friday and Saturday night audiences to give a little something to a collection for Comic Relief if they enjoyed themselves. So a huge thank you to all our very generous supporters and fans out there. We're glad you enjoyed the show so much, and we're so pleased to be able to donate this fantastic total to Comic Relief on your behalf. We love you all! Café René is now Closed. Well it has come to the end, and unfortunately Café René is now closed. We had a wonderful time serving all you lovely ladies and gentlemen, and we hope you found the ambience of Café René to your liking, and weren't disturbed too much by "ze goings on". We would like to sincerely thank every one of you who came along to see the show, supported the club and hopefully thoroughly enjoyed themselves!! A special well done and thank you also goes out to everyone involved in putting on the show: our fabulous production team, backstage and technical crew, the front of house team, and of course the cast! See you at panto time... watch this space!